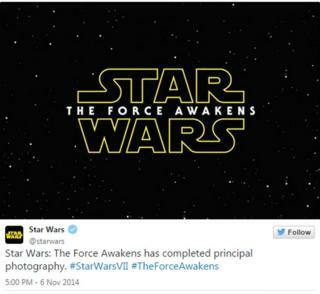 The title of the new Star Wars movie has been revealed as The Force Awakens. The seventh instalment of the sci-fi saga is set about 30 years after the events of Star Wars: Episode VI Return of the Jedi. The film sees a new cast including Daisy Ridley and John Boyega joining original cast members Mark Hamill, Harrison Ford and Carrie Fisher. The announcement was made on the movie's final day of production at Pinewood Studios, just outside London. Star Wars: The Force Awakens has been directed by J J Abrams, who successfully reinvigorated the Star Trek movie franchise in 2009, and is due to be released on 18 December 2015. Have Jedi created a new 'religion'?